Item Name: 021-1332 Pansy Wreath Quilt Blocks Stamped X.S. 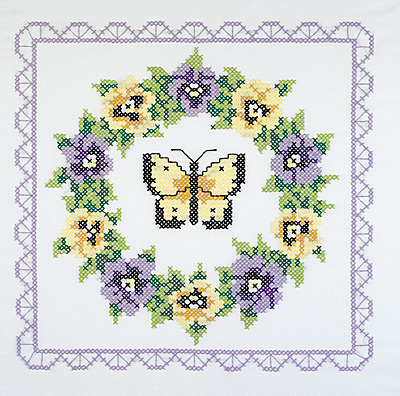 Pansy Wreath Quilt Blocks Quilt is made with blocks of stamped butterflies and flowers on broadcloth to assemble yourself with colors of your choice. 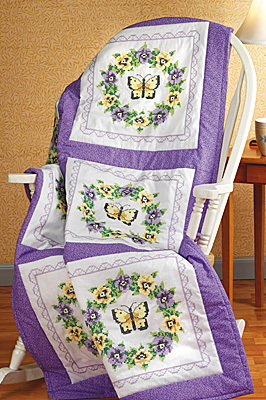 May be accented with our Pansies and Butterfly pillowcase pair and dresser scarf. Kit contains: 6 screen- printed 18"x 18" 50/50 polyester/ cotton broadcloth blocks, needle, graph, and instructions. Floss not included.